Private Lessons with Mark Weiss, March 26, 2019!!!!! Ballroom & Beyond is “BEYOND” excited to have Mark Weiss in the house to work with our students on March 26, 2019! 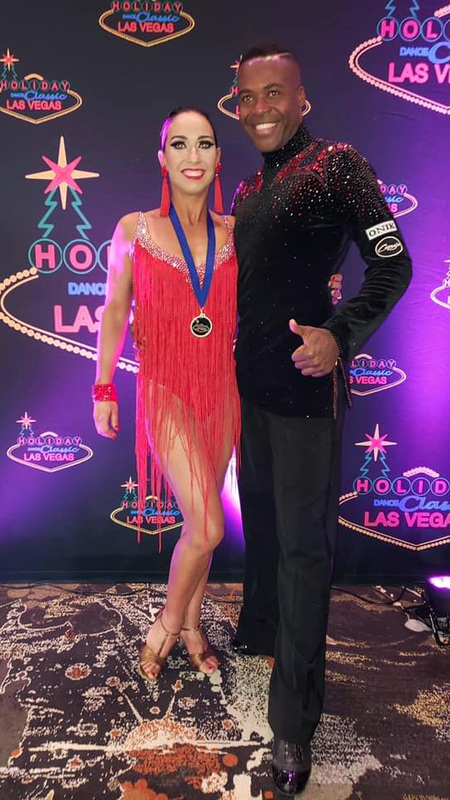 Mark has been a professional ballroom and latin dancer, teacher, coach and choreographer for over 30 years becoming International Latin Rising Star Champion and a finalist of the Open International Latin at the United States Dancesport Championships after only 5 years of competitive dancing. With a focus on fundamentals of movement, actions, dynamics, musicality and partnering Mark uses simple and consistent concepts that any dancer can utilize at any level of dancing. He has an extensive resume in the performing arts as an actor, singer, dancer, and musician as well as experience behind the scenes working on theater productions and dance sport competitions across the country. Mark was a choreographer for seasons 1 and 2 on the hit Fox TV show “So You Think You Can Dance”. He is a nationally certified adjudicator in all styles of ballroom dancing. What an epic event! This year’s Steampunk themed showcase, choreographed to songs from The Greatest Showman and Moulin Rouge was a hit! We are so proud of all of our dancers and honored to work with each and every one of you! Looking forward to showcase 2019!!! Tickets are now on sale for The Greatest Showcase! A spectacle of dance, choreographed to the music of Moulin Rouge and The Greatest Showman! Showcase numbers will be performed by Ballroom & Beyond’s very own team of youth and adult students as well as our world class dancers and instructors. Our cast members have been working extremely hard and we’d love to show them the thrill of performing in front of a full house! So, invite your friends and family, and come to the Space Gallery in Denver’s Sante Fe art district on December 12, 2018 to watch this magical show! Tickets include appetizers and refreshments! Ballroom & Beyond presents The Greatest Showcase to hit Denver on December 12, 2018! Come watch Denver’s finest ballroom dance students show off their talents in this magnificent one hour spectacle followed by an after party where guests can mingle with the cast! The Greatest Showcase will be held at in the Space Gallery located in Denver’s Sante Fe art District at 400 Sante Fe Drive, Denver CO 80204. Doors open at 6:30pm and the show starts at 7:00pm. Appetizers and refreshments will be served. Tickets go on sale November 1st! We can’t wait to see you there! Keep your eye out for details on our upcoming Adult Bootcamp in our next newsletter. Mark your calendars for July 27, 2018 and get ready for Ballroom & Beyond’s first night Out-on-the-Town! Come enjoy an evening with us and taste the finest and funnest nightlife Denver has to offer. We’ll start with appetizers and cocktails at a local venue. Then we’ll hit up one or two of Denver’s hottest nightclubs featuring your favorite social dances! Contact Ballroom & Beyond for details. We've updated our youth dance program! We now have two youth group dance classes on Wednesday night! Ballroom & Beyond crushed the competition at this year’s Colorado Star Ball with our talented students taking the gold in every entry! We’re exceedingly proud of our youth dancers Malia, Marion, Joslyn, Anderson, and Griffin for completing their first competition with such a kick! Keep your eye out for these little ladies and gentlemen at our upcoming showcase! They are sure to burn a hole through the floor! We’d also like to extend special congratulations to first time competitor Josh and returning competitor Kacey for turning up the heat and finishing with a flair! Look out Colorado! Look out dancesport! We’ve got Denver’s elite dancers in the house! Ballroom & Beyond now open for business! Visit us at 300 Josephine Street Ste 220, Denver, CO 80206 to start your ballroom dance journey today!